Submitted by Alexander Briones on Jan. 14, 2019. First published on August 9, 2017 and last updated on January 15, 2019. Looper pedals have become indispensable to musicians, thanks to their ability to create clones which you can use as virtual accompaniment. Here we look at what the market considers as the best looper pedals, divided into two categories - Compact & Multiswitch, and updated to reflect the most recent expert and user feedback up to January of 2019. Generally, compact loopers are expected to provide basic looping functionality, while multi-switch ones offer more control and multi-track looping. We've listed the top rated ones below, sorted by price so you can pick out the best loop pedal for your needs and budget. We've also included detailed descriptions and actual user feedback for each one, along with important pointers and features that you should watch out for. 89 out of 100. Incorporating 550+ ratings and reviews. The RC-1 Loop Station follows Boss' tried and tested single stomp box design, ideal for those looking for an easy to use loop pedal. What makes it stand out from other basic loopers is its 24-segment LED indicator, which lets you visually monitor your settings. It sports up to 12 minutes of loop time, which is more than enough for the usual phrase looping, making it viable for keeping song and riff ideas. Another nifty feature of this pedal is its stereo input and output compatibility, a nice addition for those with complex stereo setups. Dimensions: 2.375" x 5.125" x 2.875"
Ease of use is consistently mentioned in reviews. Beginners appreciate how easy it is to setup and work with, while experienced musicians are happy with its loop indicator. Since it is from Boss, there is no doubt about its reliability and build quality. Lack of bundled AC adapters are often cited as cause of concern, so it is recommended that you buy one along with the pedal. If you're looking for a reliable and simple way to make single channel loops, then the Boss RC-1 is a great place to start, or maybe even end, your search. 91 out of 100. Incorporating 2000+ ratings and reviews. 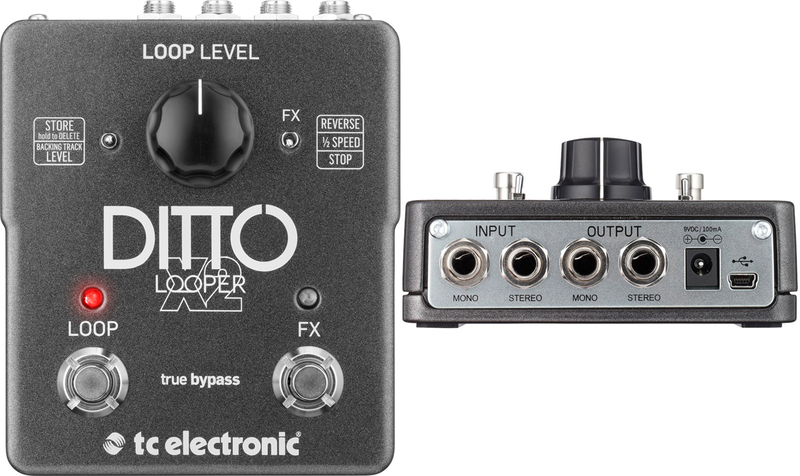 The TC Electronic Ditto Looper is easily the most popular among compact guitar loop pedals, and it turns out that it is also the highest rated one. This is all thanks to its sound quality and straightforward design, with only a single footswitch and a single knob. The pedal's one and only footswitch allows for basic looping controls that include record, playback, overdub, undo and redo. While convenient, getting a good handle of all the loop controls requires some practice. In addition, there's the Loop Level knob, which lets you adjust the volume of the loop playback in relation to your dry signal. Note that while it has a total loop time of 5 minutes, it lacks memory slots for storing multiple loops. Still, this limitation is a given, since it is the smallest in this group and is supposed to be as straightforward as it gets. Many experts and users agree that the TC Electronic Ditto is the best entry-level guitar looper pedal. While its compact size and intuitive design are its strongest points on paper, reviews point to its sound quality as its best feature. 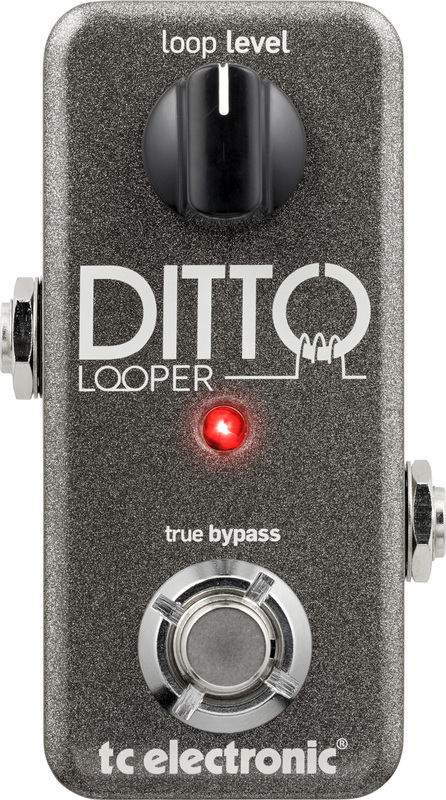 Some even report that the humble Ditto sounds better than bigger and more expensive looper units, which is quite the compliment. There are a few who complained about not having the option to run on batteries, while others cautioned that the one footswitch control requires a bit more time to master. Obviously, this pedal is not for musicians who are looking to do complex looping performances. With its simplicity and sound quality, the TC Electronic Ditto Looper is a great pedal to start your journey into the world of looping. 89 out of 100. Incorporating 600+ ratings and reviews. With over three decades of experience building loopers, DigiTech pulled no punches with the JamMan Solo XT, a feature packed looper in a standard size stompbox. It starts off with an already impressive total loop time of 36 minutes, but it can go as far as 16 hours when you utilize a micro SDHC card. You can divide the loop time into 200 internal memory slots and 200 external memory slots, for a total of 400 loops, which is expansive considering the unit's size. While it is primarily meant for guitar players, this pedal comes with an Aux input, that lets you record music and backing tracks into memory slots, giving you instant accompaniment for practice or performance. Other features include the ability to adjust the tempo of your loops without changing the pitch, auto-quantize, multiple stop modes, and it comes with a handy built-in metronome with multiple time signatures and rhythm sounds. Finally, the JamMan Solo XT comes with DigiTech's modular JamSync technology, which lets you connect multiple compatible devices for multi-track looping. Dimensions: 2.75" x 5.00" x 2.13"
One user aptly put the overall market sentiment into three letters, stating that the DigiTech JamMan Solo XT is the "MVP" (Most Valuable Pedal) among standard size loopers. Even experts chime in, commending DigiTech for stuffing this pedal with features that surpass what others in the same price and size range offers. Ironically, its bulk of features do not impress everyone, but they do commend its overall sound and performance. Experienced guitarists recommend getting the optional 3-switch foot controller to make better use of the pedals features. 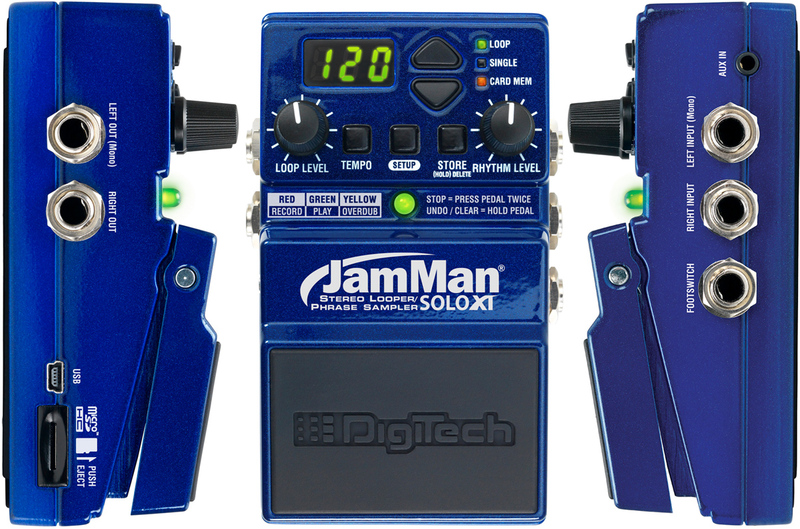 If you're looking for the best bang-per-buck compact looper pedal, then get the JamMan Solo XT. 89 out of 100. Incorporating 1250+ ratings and reviews. 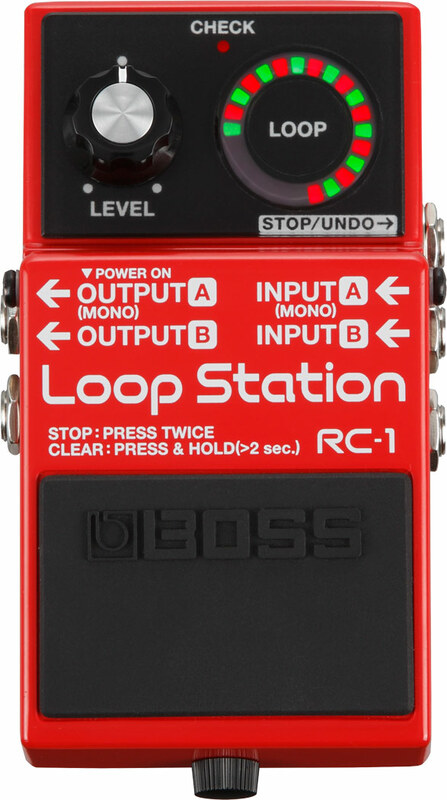 The Boss RC-3 Loop Station is Roland's response to market demand for feature-laden compact loopers. Boss was able to pack this single-pedal size unit with expanded connectivity, which includes stereo input/output, aux-in, external foot pedal controller and USB 2.0. Complementing its connectivity are useful features that include up to 3 hours of recording time, 99 memory slots, and onboard drum loops. The unit's USB connectivity lets you manage your loops with your computer, allowing you to save and add loops to the pedal as you please, be it your own guitar loops, or full-band backing tracks. Finally, all of these features are packed inside Boss' signature single stompbox pedal, so you can expect it to be roadworthy and easily outlast your other gear. Dimensions: 2.4" x 5.1" x 2.9"
Market response to the Boss RC-3 Loop Station is overwhelmingly positive, thanks to its balance of features, sound quality and value for money. The bulk of reviews come from guitarists who use it for practice, while some use it for performance and even incorporated it into their teaching. A few users commented that doing live loop performance with single footswitch pedals require practice, but they do add that learning to use the loop pedal properly is very rewarding. 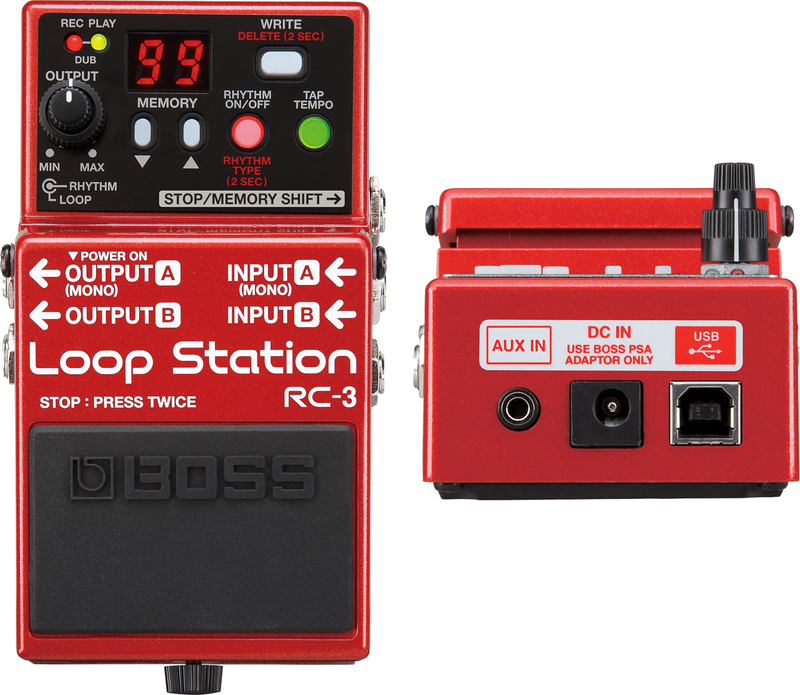 If reliability and quality is your primary concern, and you want a looper pedal that can double as a practice/songwriting tool, then definitely consider the Boss RC-3 Loop Station. 90 out of 100. Incorporating 175+ ratings and reviews. 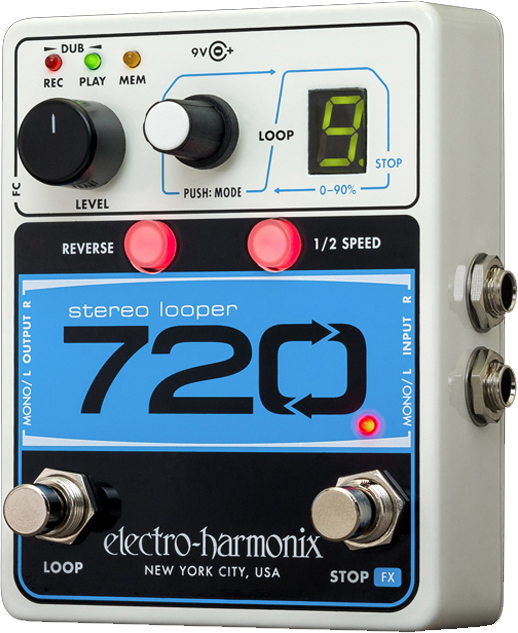 The EHX 720 Stereo looper lets you store up to 10 independent loops that total 12 minutes, which is more than enough for many loop pedal users. It also gives you the convenience of two foot switches, while retaining a somewhat compact profile. There's even an input jack for adding a 3rd optional foot controller if needed. Other features include a speed down (half time) control and a reverse playback function, for those who are brave enough to go experimental with their loops. Audio Quality: 24-bit conversion at 44.1kHz Sample Rate. Dimensions: 2.25" x 4.00" x 4.75"
Awesome, fun and sweet are just three of the many positive adjectives that owners use to describe the EHX 720 Stereo Looper. Most of them appreciate the two footswitch configuration, while others are fond of the reverse playback and 1/2 time playback feature. Sound quality and build also gets commended often. There are a few who experienced glitching, where the timing of the loop playback is off, but the good reports far outweigh them. More often than not, this may also be attributed to user error. The EHX 720 Stereo Looper is a nice tool for those looking for more control while keeping the size small. The popularity of the original Ditto Looper prompted TC Electronic to follow it up with the Ditto X2 Looper. It carries over the same intuitive single-track looping functionality of the original, but adds stereo input/output, USB connectivity and a section for loop effects, complete with a dedicated controls. The looper section is a straightforward as its compact sibling, with up to 5 minutes total recording time and the same single-knob loop level and single-footswitch controls. The Loop Effects section lets you switch between half speed and reverse looping effects, and it also allows you to use both at the same time. Finally, the built-in USB port lets you export and import loops from your computer. The TC Electronic Ditto X2 Looper impresses many experts and users with its sound quality and ease of use, including Premiere Guitar, who describe the overall sound as excellent. It also helps that many are happy with the extra footswitch that can be used as extra loop control. Still there are some who expected more in return for the money they spent, and a few reported encountering glitch issues. Overall, the TC Electronic Ditto X2 is a great 2-foot switch upgrade to the original Ditto and other compact loop pedals. 89 out of 100. Incorporating 150+ ratings and reviews. 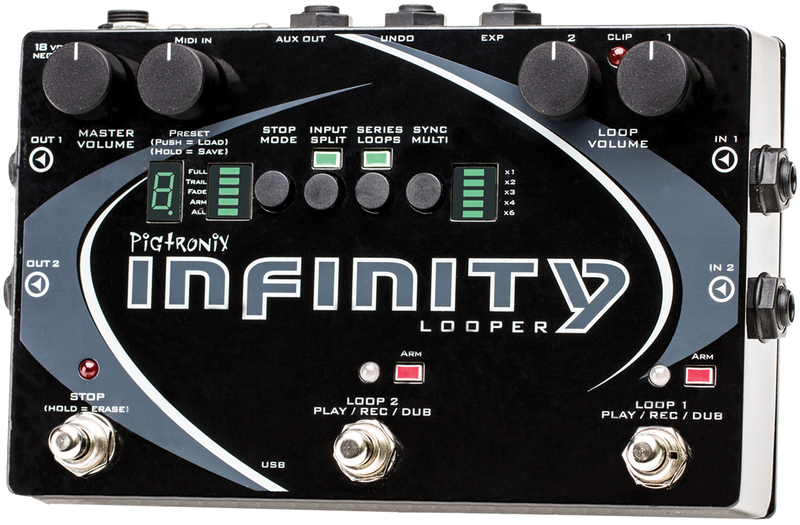 The Pigtronix Infinity Looper Pedal offers a major step up in features, with its two track looping, expanded connectivity options and MIDI compatibility. Speaking of connectivity, this looper comes with two distinct input/output ports, which lets you record two different sound sources into dedicated loops and playback via dedicated outputs. There's also an Aux loop out that can be used to send looped audio to a monitor, so your band can play in sync with your loops. For working with live DAWs and other MIDI capable devices, this unit accepts MIDI Clock start and stop messages. Basic functionality for each of the two loop tracks are available, including record, playback, overdub, undo and redo. Other features include reverse playback, loop aging, stuttering, five different stop modes, 50 memory slots, bundled 8GB SD Card (Up to 2 hours of recording), and USB connectivity. The Pigtronix Infinity Looper receives most of its high ratings from experienced guitarists who are looking for a MIDI compatible loop pedal. And while it doesn't have that many effects, signal routing options and loop related features provide more than enough flexibility for most musical styles, as reviewers attest to. Sound quality is also commendable, as reported by many guitarists, keyboardists and even DJs. There are a few who find the features lacking when considering its price tag. There are also some reports of minor cosmetic and build quality issues, although they are few and far between. If MIDI compatibility is your priority, and you don't want the bulk and extra features of the Boss RC-300, then the Pigtronix Infinity Looper is ideal for you. Thanks to the popularity and high ratings of the RC-300 Loop Station, Boss continues to be THE boss of the looper market. Being their flagship model, it carries the best that Boss can offer, with three independent stereo loop tracks that allow for complex arrangements fit for one-man-band performances. To complement its multi-track design, Boss equipped the RC-300 with a myriad of input options, including a balanced XLR mic input with switchable phantom power for looping vocals and other miked instruments. This means that you can record and load guitar, percussion and vocal loops on three different tracks. Output options are also expanded, with stereo main and stereo sub outputs, as well as a headphones out. USB and MIDI connectivity are also available, which widens the versatility and device compatibility of the unit even further. Other noteworthy features include in-depth loop settings and controls, a wide variety of built-in effects, and it also comes with an assignable expression pedal. 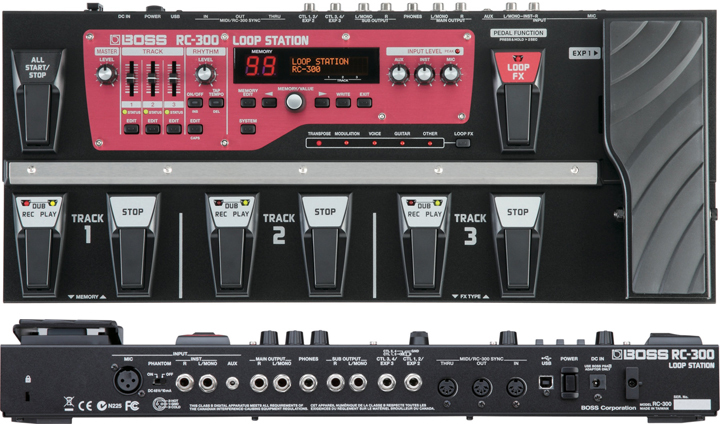 The Boss RC-300 Loop Station continues to be the pedal of choice for many musicians, including one-man-band artists. Good reviews and commendations continue to pour in from users and experts alike. Guitarplayer.com describes the unit as being "highly flexible", "built to withstand nuclear holocaust" and commends it for having a "great sound". Still, there are a few who are not as convinced with the RC-300, specifically complaining about the quality of some of its built-in effects. And while there's a lot of things that you can do with it, there are a few practical features that are missing, like the ability to split the input into dedicated loop tracks. Being an owner of a Boss RC-300 Loop Station, I have to add that I see it as a very inspiring and fun tool to have, be it for practice, performance or for songwriting. Whether you have the budget or not, the Boss RC-300 is definitely a worthy investment if you want to get serious with your looping craft. 93 out of 100. Incorporating 90+ ratings and reviews. Since the pedals listed above are mostly aimed at guitarists, I found it fitting to add a compact loop pedal aimed at vocalists, and that is what the TC Helicon Ditto Mic Looper is all about. It's as straightforward as the original Ditto, only this one features Balanced XLR input and output ports for connectivity with microphones and PA systems. For easier hands free control over the sound, this unit comes with two footswitches, one being a dedicated stop switch, and the other controlling recording, playback, undo and redo - depending on how you step on the switch. Finally, there's the loop level knob that lets you adjust the output volume of the loop playback. In addition to looping singing and vocal beatboxing, TC-Helicon also markets the Ditto Mic looper as a looper for acoustic instrument musicians, allowing them to record and loop non-electric instruments via microphones. The TC-Helicon Ditto Mic Looper's practicality and good sound quality came up in many reviews. Many of which report that the pedal is easy and fun to use, and that it has the right balance of durability and portability. Satisfied users report getting great results while using the pedal with vocals, human beatboxing, percussion instruments, harmonica, acoustic instruments, and many more. There are a few users who wished for extra features like the ability to be powered by battery and better stop loop functions, but the limitations are to be expected given its size, price and streamlined design. If you're looking for a way to sample and loop vocals and other miked sound sources, then the TC-Helicon Ditto Mic Looper is the most practical and portable choice. While compact looper pedals may seem straightforward, controlling loops with their single footswitch can be a challenge. Manufacturers usually require you to do various "dance" steps to trigger different functions like recording, playback, undo and redo. These steps include double steps, hold steps and quick release. Multiswitch loopers offer easier handsfree control of the loops, since they often have two or more footswitches dedicated to each loop. The obvious downside is that you'll have to memorize which switch is which, and that they require more bulk and pedalboard space. Over two decades ago, DigiTech released the PDS 8000 looper pedal which had a total loop time of 8 seconds. These days, some loopers can store up to 16 hours of high-fidelity loops, thanks to the availability of compact memory cards. Still, you have to note that more is not necessarily better, especially if you're just going for basic one track looping and overdubbing, as evidenced by the popularity of the TC-Electronic Ditto Looper, with its 5 minutes total loop time. But if you're planning to craft, organize and utilize different loops, then you'll want more loop time and multiple memory slots. It is a given that Multiswitch pedals have more memory, but there are some compact pedals that offer expandable memory and memory slots. Single-track Loopers are generally good enough for most guitarists, especially those who just want basic looping and are already playing with a band. Their straightforward operation and simplicity makes them easy to implement, while their compact size makes them easy to add into pedalboards. All of the compact pedals in this list are single-track loopers, but some do allow for multi-track functionality by connecting them with another compatible looper pedal. Multi-track Loopers offer more control and allow for crafting more complex loops, with the downside being the extra bulk, longer learning curve and more importantly, added cost. They are usually preferred by guitarists who also sing, and one-man-band performers who want in-depth control over every loop. For basic mono setups, a compact looper pedal with one input and one output port is enough to get the job done. More complex rigs, or keyboard instruments with stereo outputs will require stereo input and output ports, which are provided by some of the pedals in this list. Aux input is a nice plus to have, as it allows you to jam with your favorite tracks, or even store them as loops. A few pedals have headphone out, which is nifty for quiet practice. Some loop pedals with USB connectivity allow you to save and manage your loops on your computer, this is pretty handy if you're gathering musical ideas. MIDI compatibility is also an important consideration if you're planning to integrate a looper with MIDI clock compatible devices like drum machines. Pedalboard space is considered as an ever decreasing resource, so careful planning is recommended before buying your pedal. For this reason, we provided the dimensions of each unit, so you can prepare your board ahead of time. We've also stated the weight of each pedal so you can gauge their portability. While the focus is on looping, it doesn't hurt to have extra features like built-in metronomes, rhythms and effects. But too much is never good, especially if it will keep you from being productive and inspired. Bottom-line, just get ones with the features you actually need, or don't waste too much time on things that you're not really going use for your performances or song ideas. As much as we would like to add custom made loopers, like ED Sheeran’s Chewie II, we have to stick to what the average user can actually buy. So we looked for the most popular and widely available loopers, and decided to limit our research to just floor-based pedals. For this early 2019 update, we ended up studying 18 looper pedals and gathered over 10,000 relevant reviews and ratings, all of which were processed by the Gearank Algorithm. The resulting scores were used to trim the list down to the best rated ones. Finally, we divided the list into two categories, Compact and Multiswitch pedals, and sorted them by price so you can see which ones fit into your budget and needs. For more information about this process see How Gearank Works. Submitted by Wolvebird (not verified) on Sep. 23, 2017. I would like to clarify that the Boss RC-3 is does not have 24-bit playback; it has 16-bit playback and is commonly regarded for having mediocre sound quality. This is the biggest ( if not only ) reason it is not the number one selling looper in my opinion. The Ditto x2 is probably the highest quality playback. I expect better research from a page dedicated to gear.. If you're hiring let me know. Submitted by Jason Horton on Sep. 24, 2017. Thank you very much for pointing that out - I was the editor for this guide and I missed the mistake, but I've fixed it now. Submitted by Derek (not verified) on Jul. 24, 2018. Can't believe the boss rc300 is rated higher than the infinity. Sound quality on the rc is was below the infinity which is a huge factor for me. No mention of the boomerang? Submitted by Jake (not verified) on Aug. 6, 2018. Submitted by Jason Horton on Jan. 14, 2019. Submitted by Craig (not verified) on Jan. 28, 2019. It appears that the specifications for the RC-3 aren't quite correct... 99 slots, no memory card slot. Probably doesn't have JamSync feature (Digitech probably wouldn't license that to Boss). Thanks for pointing this out Craig, I have corrected the specifications. Submitted by tommy (not verified) on Mar. 4, 2019. Not including the Line 6 looper makes this whole review suspect - it's by far the best. Submitted by Jason Horton on Mar. 4, 2019. I assume you're referring to the JM4. It was on our short-list but didn't have high enough ratings for us to include it in our recommended list above - you can see the current Line 6 JM4 rating here. Submitted by Christoffer G Nelson (not verified) on Mar. 13, 2019. The expandability of the JamMan system is about the best I can imagine - with three or four different XT pedals, being able to not only sync one player, but many, that's just excellent.